Charlie’s favorite show is Max & Ruby. There’s one episode where Ruby and her best friend Louise start a lemonade stand. Charlie loves that episode and, by extension, now he loves making lemonade (well, technically he loves “helping” me make lemonade which usually means strewing lemon juice and sugar all over the floor). Charlie, however, doesn’t much like drinking lemonade. So invariably we have a bunch of lemonade in the refrigerator at any given time. After a particularly stressful day recently, this beleaguered momma got creative. Pour a small amount of sugar onto a plate. Grab a martini glass and run the rim under some water. Upend the martini glass into the sugar, making sure that a nice amount of sugar sticks to the entire rim. Turn the martini glass over and attend to making the martini. If you have a cocktail shaker, put some ice in the shaker and then combine the vodka and lemonade in whatever ratio you choose. 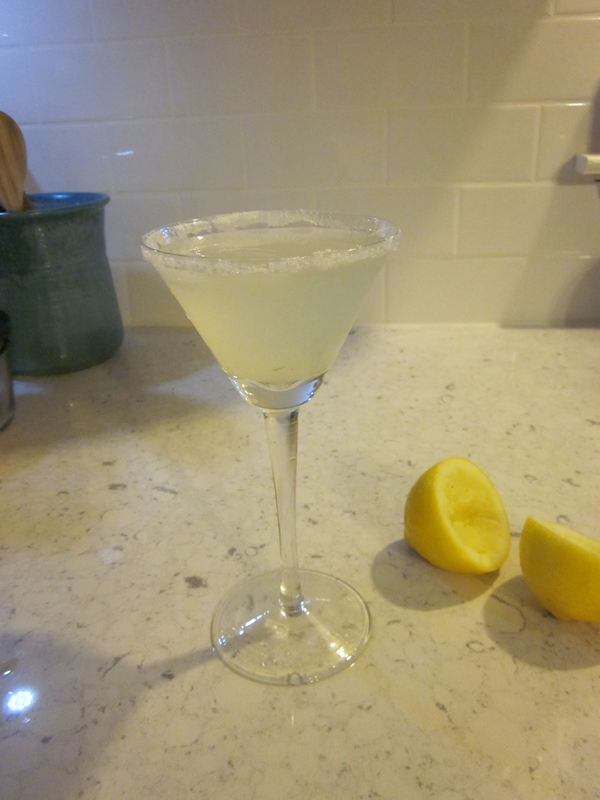 I use about one ounce of vodka and four ounces of lemonade for each martini; more adventuresome souls might wish to up the vodka to lemonade ratio. Give the vodka and lemonade a good shake. Strain the martini into the sugared glass. If you don’t have a cocktail shaker, just put some ice in a glass, add the vodka and lemonade and stir with a spoon to get the liquid nice and cold. Pour the martini into the sugared glass using the back of the spoon to block the ice from dropping in (it’s not awful to have ice in your martini, but the drink will look classier without it). Sip and relax on a hot summer night. In case you have trouble differentiating your greens, this includes Swiss chard, bok choi, lettuce, kale, and beets (I eat the greens as well as the beets). 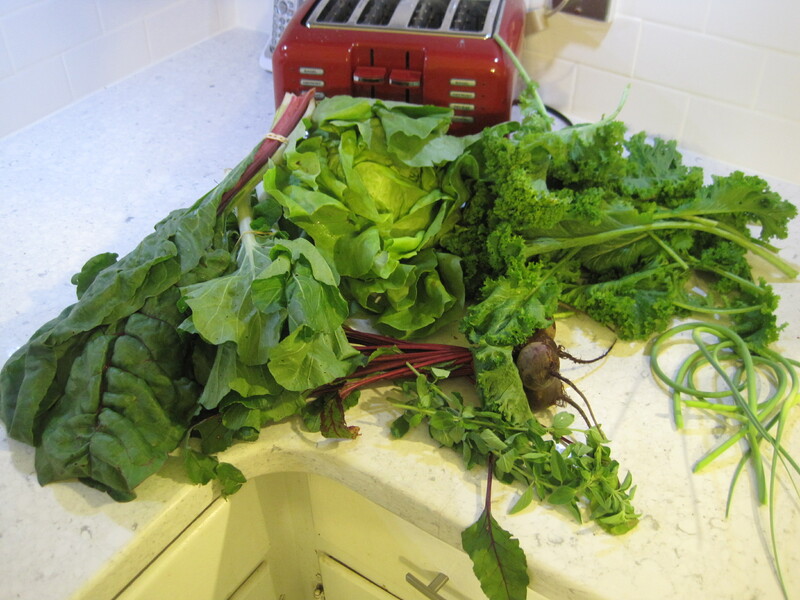 Other weeks we’ve had mustard greens, Napa cabbage, senposai, and collards. While I’ve had success preparing greens a few different ways (some of which I even blogged about here, here, and here), I need additional options. So dear readers, do you have any recipes for greens that you’d be willing to share? I would be most appreciative. Actually, at this point, I suspect Mark would be the most appreciative member of the household. He doesn’t really like greens to begin with and yet they keep appearing on our dinner plates cooked in the same manner each time. Several weeks ago I came across a recipe online for kale salad. In addition to kale, it had chunks of avocado and apple. And that’s all I could remember. I searched for it again the other night when I saw that I had both kale and avocado that needed eating. I couldn’t find it (although I did find other, similar recipes), so I just experimented with things we had on hand. The resulting salad was surprisingly good. 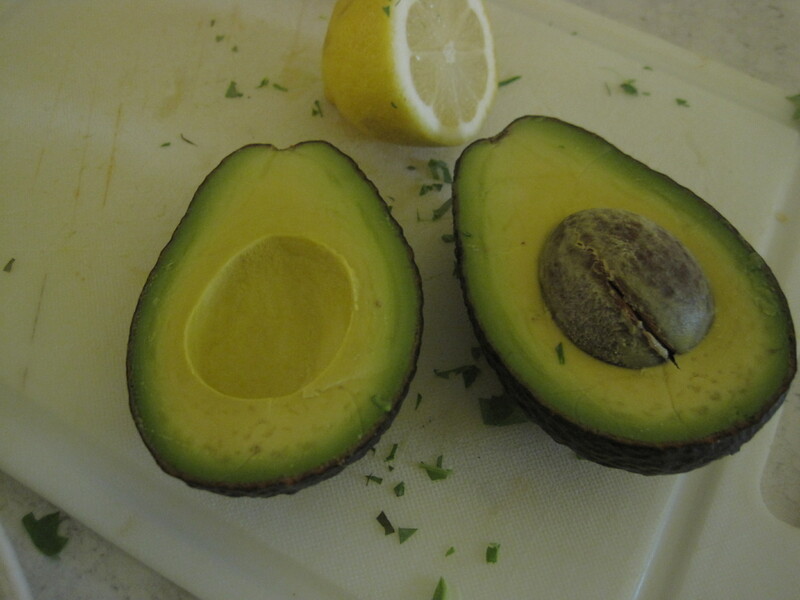 But before I get to the recipe, take a look at this near perfect avocado. Despite all my years living in southern California, I never mastered the art of selecting perfect avocados. I just got lucky with this one. Cut the stems off the kale and then cut the leaves into small, bite-size pieces. Place into a bowl. Drizzle the lemon juice over the kale and toss together. 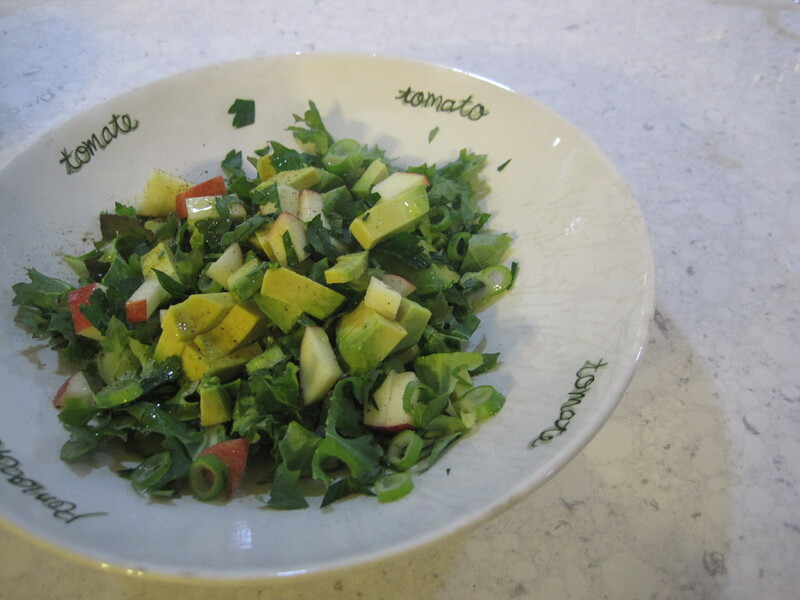 Add the avocado, apple, parsley, and green onion. Drizzle the olive oil over the top and add the salt and pepper. Toss to combine. 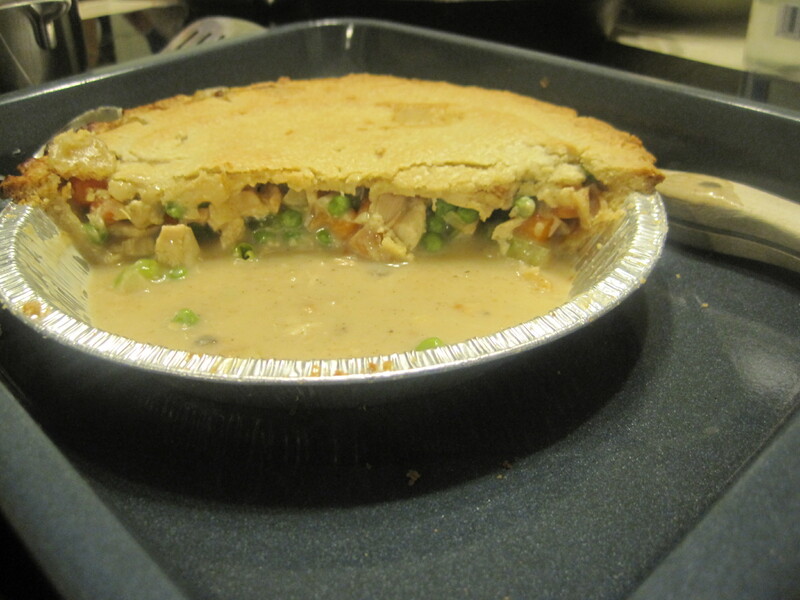 Not long ago I posted a chicken pot pie recipe, which I’ve made many, many times. One day we didn’t have any chicken, but we did have all the other ingredients, plus a couple of extra veggies on hand, so vegetable pot pie was born. Now I’m not sure whether I like chicken or vegetable pot pie better. What a dilemma! Preheat oven to 425 degrees F. Place carrots, peas, celery, potato, and broccoli in a pot with just enough water to cover. Boil the vegetables until slightly tender, about 10 minutes. Drain and set aside. Meanwhile, melt the butter in a large pan or sauce pot over medium heat and stir in the onions. Cook for a few minutes until they begin to turn translucent. Add the garlic and celery seed and let cook for another minute, being careful not to let the garlic brown. Add the cream of mushroom soup and broth, stirring to remove any lumps. Bring to a boil, reduce heat, and let simmer for about five minutes. Taste and add salt and pepper, if necessary. 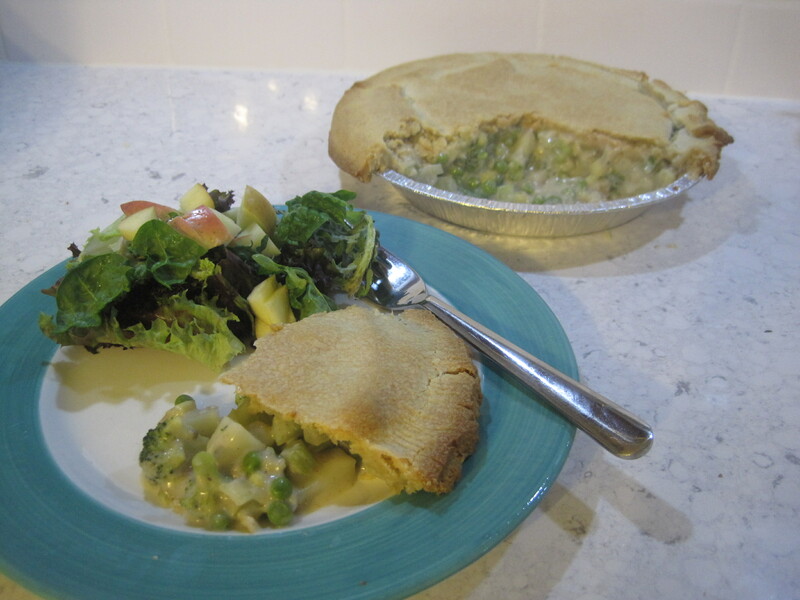 Place the set-aside vegetable mixture in the bottom pie crust. Pour the cream of mushroom soup mixture over the top. Cover with the top crust, cut away any excess dough, and seal the edges. Make several small slits in the top crust to allow steam to escape. Bake for 30 to 35 minutes or until crust is golden brown and filling is bubbling. This recipe is very forgiving – you can pretty much throw in any veggies you have on hand. I’ve used corn when we had some frozen. Sautéed mushrooms would be yummy too. Experiment and enjoy! I’m pretty much a sucker for any dish that can feed us for a couple of days, is inexpensive to prepare, and tastes delicious. This pot pie recipe does all that and is good ol’ fashioned comfort food to boot. The first couple of times I made chicken pot pie, I used this recipe that my friend Jon told me about. It was definitely good, but Jon warned me that it needed a little more flavor and I agreed. I started experimenting and came up with this new recipe which I now use instead. Jon’s original recipe calls for one pound of chicken breast, but I almost never buy raw meat. Instead, I make this pot pie when I have leftover cooked rotisserie chicken. Preheat the oven to 425 degrees F. Boil carrots, peas, and celery covered in water until just tender, about 10 minutes. Drain the veggies, add the chicken to the veggies to heat through, and set the mixture aside. Meanwhile, melt butter in a deep frying pan over medium heat and stir in the onions. Cook for a few minutes until they just begin to turn translucent. Add the garlic, celery seed, and garlic salt and let cook for another minute, being careful not to let the garlic brown. Add the cream of mushroom soup and chicken broth, stirring to remove any lumps. Bring to a boil, reduce heat, and let simmer for about five minutes. Taste and add salt and pepper, if necessary (it may not be necessary; the condensed soup can be quite salty). 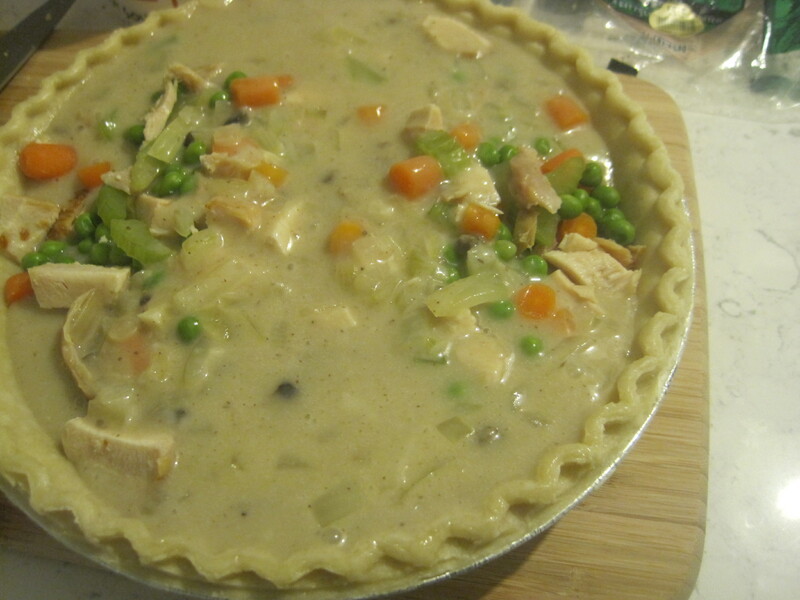 Place the chicken and vegetable mixture in the bottom pie crust. Pour the cream of mushroom soup mixture over the top. Cover with the top crust, seal the edges, and cut away any excess dough. Make several small slits in the top crust to allow steam to escape. As an aside, my top crust never fails to break apart a bit at this stage. 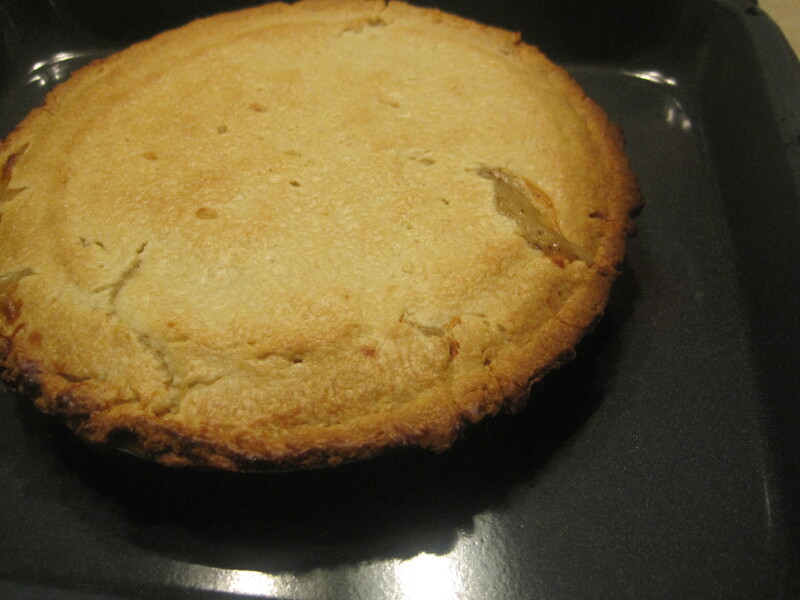 I tell myself that it makes the pot pie look more rustic. Bake for 30 to 35 minutes, or until crust is golden brown and filling is bubbling. I don’t normally buy fresh salmon because the cost tends to be prohibitive. But this weekend at the grocery store I was able to save so much money with my coupons that by the time I passed the seafood section and saw that the wild caught Alaskan salmon was on sale for $6.99, I was feeling like I’d just about earned that salmon. Besides, we didn’t even need a full pound; I got just over three-quarters of a pound for about $5.50 and we ended up with leftovers. The $5.50 price tag almost seemed like a bargain since I knew exactly how I wanted to prepare the salmon using ingredients I already had on hand. I have this recipe for an insanely good smoked salmon appetizer: the salmon is mixed with red onion, capers, and lemon juice and sits on a dill mayonnaise sauce on top of baguette slices. My mouth is watering just thinking about it. I figured that I could prepare a sauce for the fresh salmon I bought that incorporates all the same flavors. Below is the recipe for the sauce I invented. I pan-fried the salmon for about 4-5 minutes per side in a cast iron skillet over medium heat. You can cook the salmon your favorite way and just top it with the sauce. Combine all ingredients into a bowl and stir. Allow to come to room temperature (if you can stand waiting; otherwise just eat it cold like we did!). Pour the sauce over the salmon. 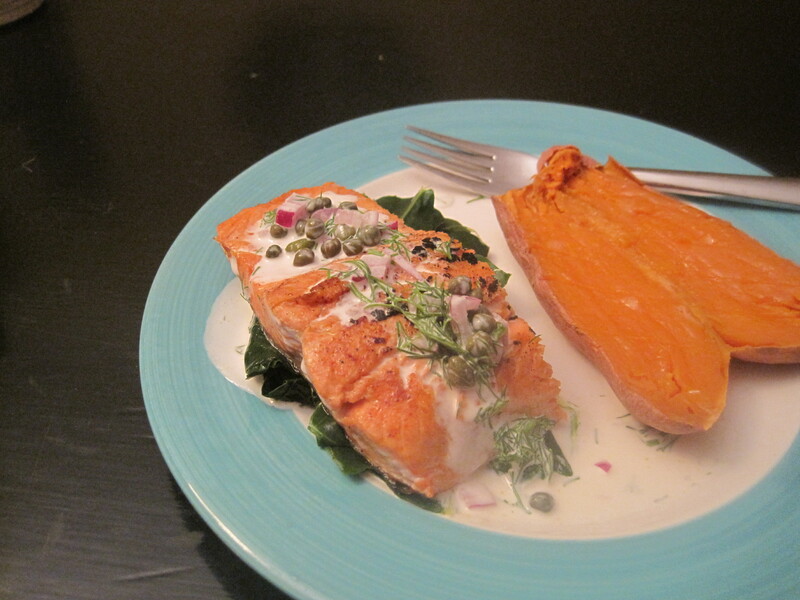 We ate our salmon over a bed of collard greens (you can see the recipe I used here) with a side of sweet potato. This recipe makes quite a bit of sauce so you could certainly halve the recipe. We had lots of sauce leftover and I’m in no way too ashamed to tell you what I did with it: I made salmon skin crackling. Mark never eats the skin from his portion of salmon (the fool! ), so I took the skin and cut it up into bite size strips and threw them back into the cast iron skillet over medium high heat. After a few minutes of sautéing, I removed the pieces of salmon skin from the pan and they were crispy and oh-so-flavorful. They were perfect for dipping into the leftover sauce. I don’t have any photos of the salmon skin crackling; they went right into my belly instead. Yum. Happy New Year! I hope 2011 is full of wonderful things for all of you. I’m doing my part to help ensure that 2011 brings good fortune for the Yikes Money household. Now that I’m a Southerner (albeit a transplanted Northerner at heart), I’m following the Southern tradition of eating black eyed peas and greens on New Year’s which are said to bring luck and prosperity for the coming year. 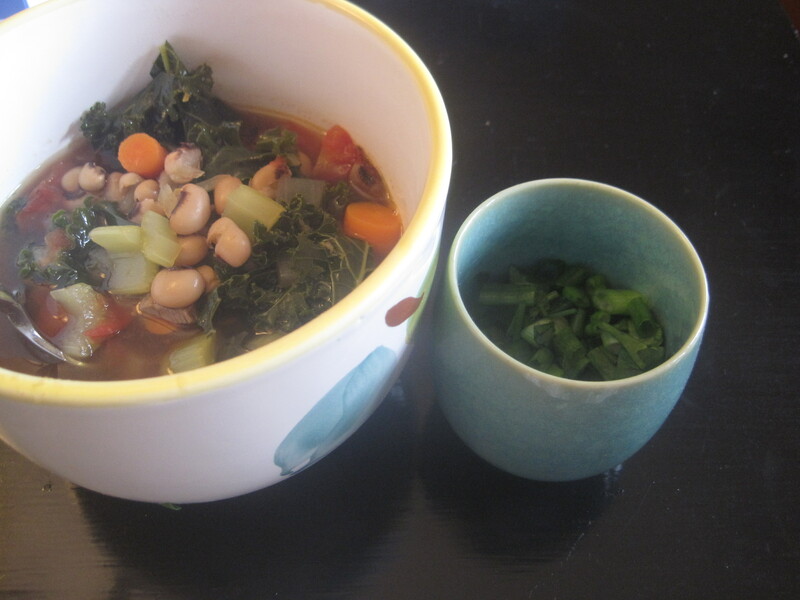 This soup recipe is a complete invention on my part, based on items we had on hand but starring the important ingredients – the black eyed peas and the kale. Don’t fret if you don’t have all of these ingredients; just use what you have on hand and all will be yummy. In a large pot, heat the olive oil over medium heat. Add the carrots, celery, and onion and sauté for about 5 minutes. Add the garlic and about a minute later add the canned tomatoes. Season with salt and pepper, to taste (don’t add too much salt if your beef broth already has salt added). Bring to the boil and add the black eyed peas, beef broth and the entire sprig of rosemary (leaves intact). Bring to the boil again then turn down the heat and simmer for about 15 minutes. Stir in the kale, cover, and simmer for 10 more minutes. Add the roast beef and gravy and stir to combine. Pull out the rosemary sprig. Stir in the lemon zest. Season the soup with additional salt and pepper, if necessary. Ladle the soup into big bowls and top with the green onions and Italian parsley. I love the added burst of flavor that the lemon zest brings to the soup. You could even slice up the lemon and squeeze in a little juice along with the green onions and parsley just before serving. Just in case black eyed peas and kale soup doesn’t guarantee my good fortune for 2011, I’m heading over to my friend Kriste’s party this afternoon where she, her sister and her mother will have prepared two Polish cabbage dishes: bigos and gołabki. On Kriste’s party invitation she wrote, “Eating cabbage on New Year’s Day is a German tradition similar to the Southern tradition of eating black eyed peas. It is supposed to ensure that one will have financial security in the coming year!” Yup, I’m all over that cabbage.